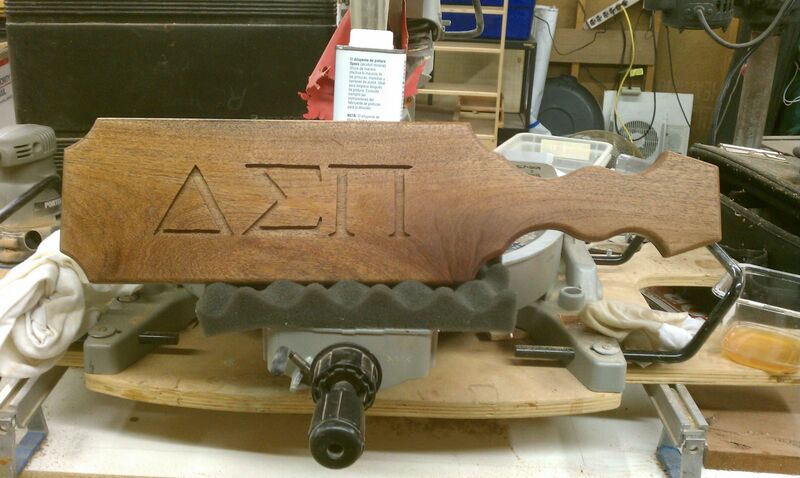 My son’s girlfriend was pledging for a business fraternity, and she needed a paddle. Being a normal broke college student, she doesn’t have a lot of money to buy a fancy paddle. She asked if I could make one for her. No problem. I love little projects like this. It’s even made out of makore. I bought a single board last year to make a sample for a project, and I had this lonely piece of makore waiting to be made into something. The shape and lettering were copied from a picture on a website. I never trace anything, or use any kind of pantograph. I just sketch everything out by eye, and go from there. The letters were routed out freehand with a small laminate trimmer using a very cool engraving router bit. It is so stable you can practically steer it with two fingers. It sure makes projects like this a little easier. I finished it off by sanding to 220 grit, and applied my own brew of wipe-on poly thinned out with mineral spirits. Nice job on the letters. I’m impressed with how clean your freehand routing looks and am inspired to give this a try. Thanks, Chris. The more squirrely the grain, the harder it is to do. I draw the lines, hog the majority, and do a final pass right to the line. It’s pretty easy really.